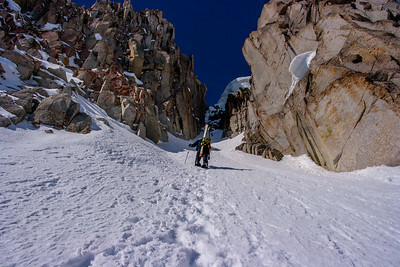 There is nothing quite like the descent of a steep narrow couloir, especially if it is of the no fall variety. It has been my passion to try and get epic captures in beautiful couloirs. Photo credit: Mike Meru This shot was taken on the north face of Mt Nebo north peak. Looking down the Conundrum Couloir, Aspen, CO. It was drizzling freezing rain on August 5th as we were dropping in. 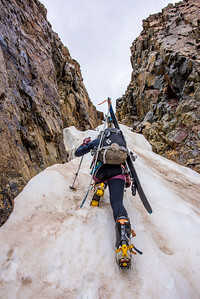 Kirsten Schiel negotiates the first pinch of the Conundrum Couloir. 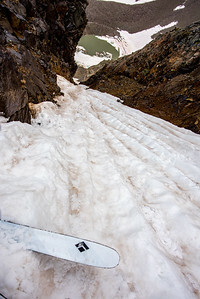 This part of the couloir was about 50 degrees and as wide as your skis. 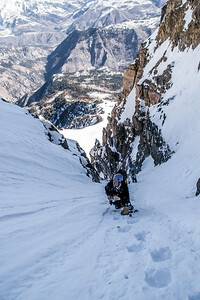 Michael Langford looks down the B&H couloir in the Wasatch. This is a good early season couloir because it fills in decent and doesn't slough off too quickly. 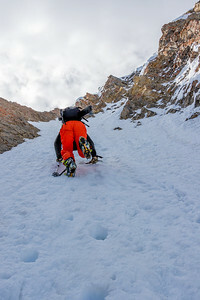 Paul Sherman climbs the B&H couloir. 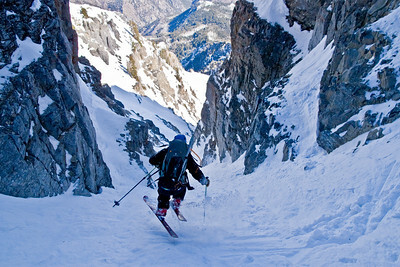 Paul Sherman skis the B&H Couloir. 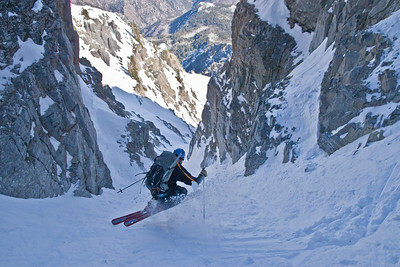 This is an all time classic Wasatch Couloir. 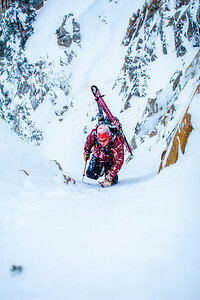 Paul Sherman skis the all time classic Benson and Hedges Couloir. This couloir gets skied a lot lately so it usually has pretty decent stability and is pretty fun on a moderate powder day. 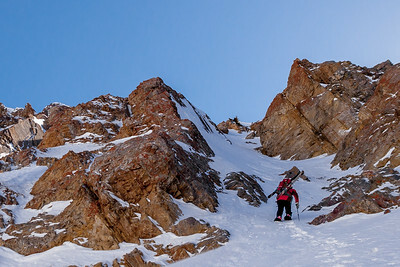 Paul Sherman skiing towards the bottom of the B&H Couloir. 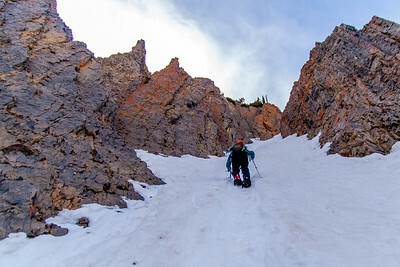 This is always a super fun classic couloir of the Wasatch. 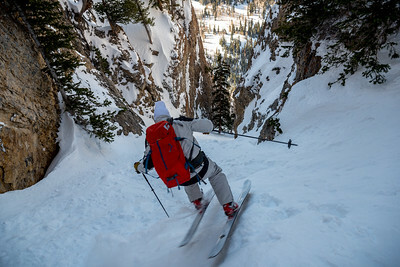 Paul Sherman makes his way up a steep couloir in the Wasatch Mountains. Who cares about a little bitt of exposure? 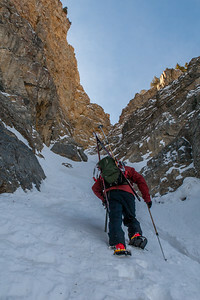 Paul Sherman climbs a steep couloir on the north aspect of Timpanogos. This couloir had a deep runnel of constantly flowing spin drift that was a bit disconcerting at the time. It also made for a somewhat difficult ski descent. 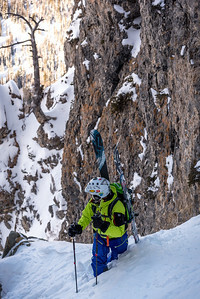 Paul Sherman takes a quick break to snap a couple pictures in the Grunge Couloir, Timpanogos, UT. Maxwell Morrill stands below. 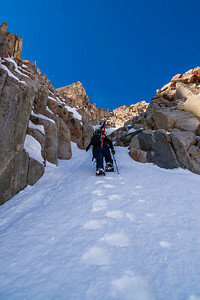 This section of the couloir is around fifty degrees and reaches a solid sixty near the top. 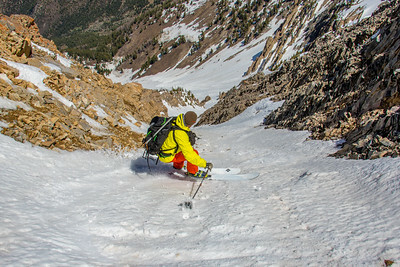 Paul Sherman skis aggressively in the pinch on the Grunge Couloir. This is an all time classic line in the Wasatch. It is a tricky line however because there is a constant barrage of loose rock missiles whizzing down the couloir regularly. 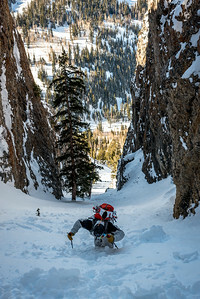 Paul Sherman climbs a steep narrow couloir on the Lightening Ridge. This one isn't in any guide books but it is one of the steeper more technical lines on the Thunder or Lightening Ridgelines. 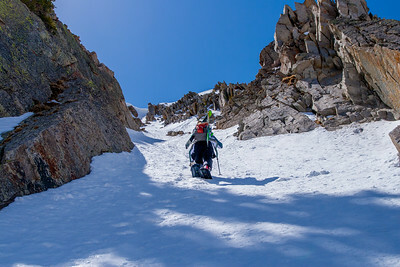 Paul Sherman climbs an obscure but highly technical couloir on the Lightening Ridge Line. 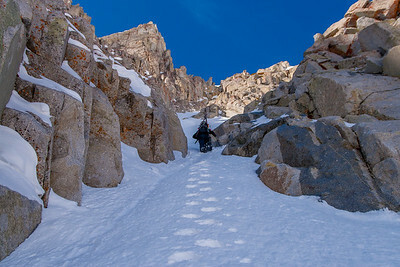 Paul Sherman drops into the Snapdragon Couloir. 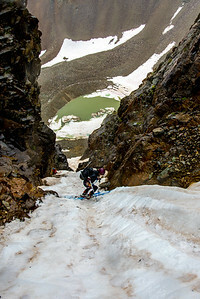 We got this couloir in some great snow which made it one epic descent. This couloir gets really steep at the top. It's not for the timid! It also has no short approach which makes it a bit of a slog in but who doesn't enjoy a good sufferfest? 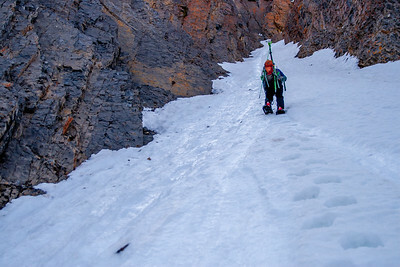 Paul Sherman nears the top of this skinny steep couloir on the central spine of Mt Nebo. 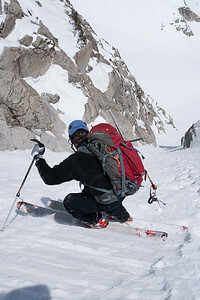 This is a long tedious approach; it is considerably harder than the couloirs on the north peak. This had a very exposed feel to it. This couloir is incredibly skinny and steep. It can be seen from the opposing ridgeline in Mineral Basin. Paul Sherman and I were near the top when it ripped out on us. Fortunately, it wasn't deep enough to sweep us or it would have been a rough ride. 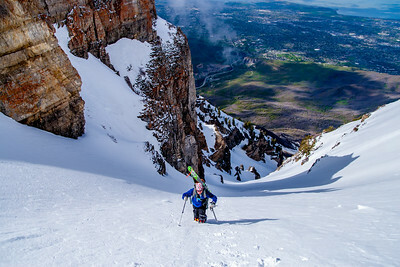 Paul Sherman climbs the west couloir on the South Peak of Timpanogos, UT. 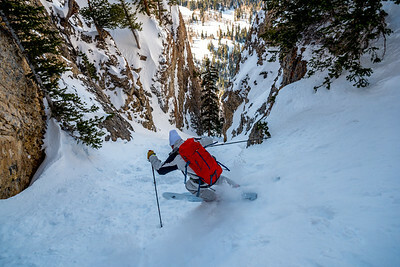 This is an incredible couloir and rarely skied. It is hella steep at the top and has tremendous vertical. It is a great springtime line and highly recommended for those wanting something different. 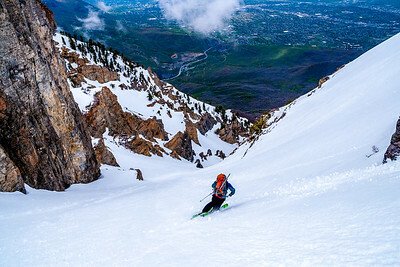 Paul Sherman skis the west couloir on the south peak of Timpanogos. 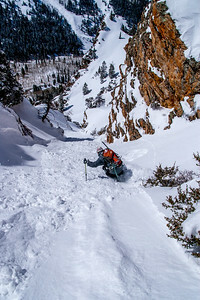 Paul Sherman climbs one of the many couloirs on Mt Nebo, UT. This is a couloir skier's dream. Paul and I have skied about ten or so couloirs on this peak and have barely scratched the surface. 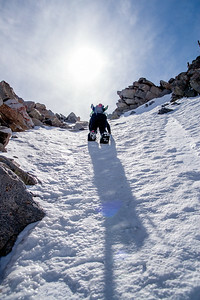 Paul Sherman climbs an unnamed couloir on Mt Nebo's north peak. 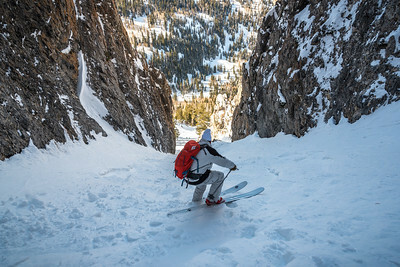 This is a couloir hunter's dream. Paul and I have skied about ten couloirs on this peak and have barely scratched the surface. Paul Sherman shows some skill on 50% boiler plate by verting by the toenails. Just a typical day in the Wasatch. Paul Sherman plants the Verts at 50%. Verts are the crampon of the Wasatch. Most of the year the snow is soft enough to make post holing a chore. 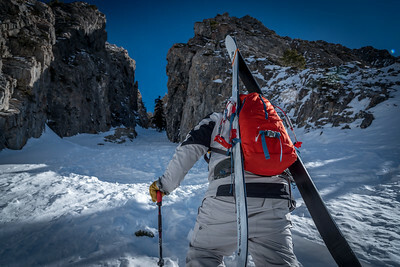 Verts have a rigid front point design that keeps you on top of the snow while giving a crampon feel on the steeps.